Homes all over China in pre-modern times had a lot in common. The way of laying out a house was similar among the rich and poor, both in earlier and later times. Certain materials and techniques, such as pounded earth foundations, timber framing, and use of bricks and tile were present throughout the country. 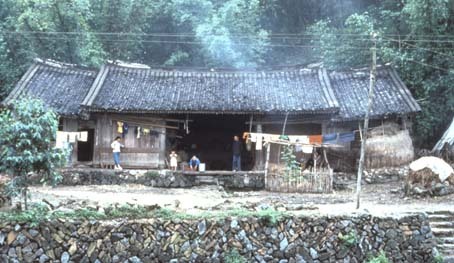 Nevertheless, houses were by no means identical in all parts of China. If we look at houses in different regions we can see much that differed from place to place. 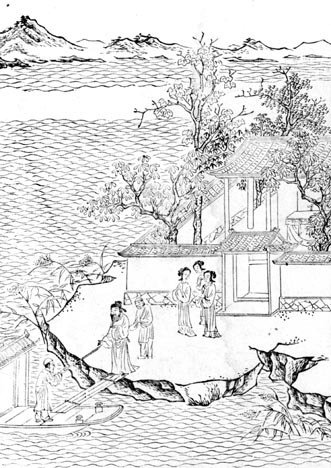 Although few examples of Chinese homes have survived from antiquity, using archeological evidence, scholars have determined that many of the basic principles of Chinese house design, such as the emphasis on orientation, layout, and symmetry go far back in Chinese history. In this unit we will examine first the basic elements of a Chinese house, then look at how houses varied by wealth and regional variation. One of the most striking aspects of Chinese domestic architecture is the practice of making houses face south. Archeologists have found that many Neolithic-period houses were rectangular with a south-facing door. 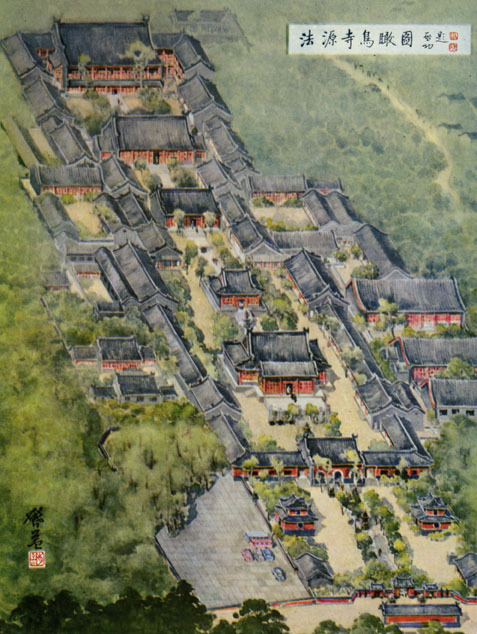 Zhou period settlements were also organized on a north-south axis. These early dwellings no longer exist, but houses in China, the earliest of which date from the Ming dynasty, also show a tendency to face south. Houses built today are also built facing south, if space allows. 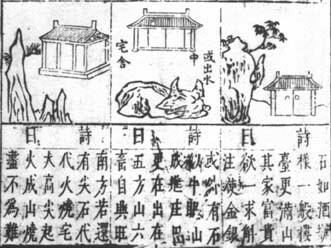 The importance of orientation developed into the practice of feng-shui which literally means "wind and water" but is often translated as geomancy. Click here to learn more about feng-shui (geomancy). Feng-shui concepts also dictated the kinds of material used in buildings. Combined with the location of the building, the proper building materials were thought to re-direct beneficial energy for the inhabitants. The most common building materials for houses in China are earth and wood, both of which have positive associations. The foundation of a house generally is made of pounded earth, and in some situations where wood was rare, earth was used in the construction of walls. Earth can be pounded into shape or made into bricks for walls. Click here to see how buildings are made of pounded earth and how bricks are made. For roofs, depending on the wealth of a family, the material could vary. 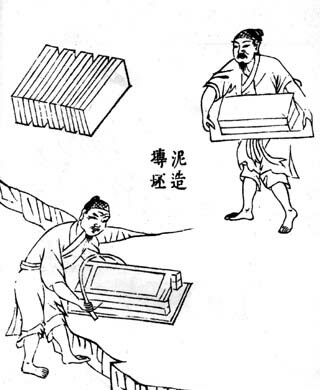 Clay is a fairly common material for making tiles for roofing. Click here to see how tiles are made. In some areas, for poorer people, thatch and bamboo were also common material. How do these building materials differ from ones found in your environment? Where wood was available and affordable, it was used to frame houses, providing support for the roof. 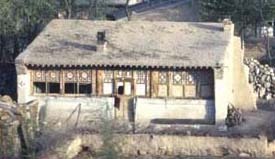 The wood framework systems for Chinese homes and other buildings were standardized by the Ming dynasty and differ from wooden frameworks used in other parts of the world. Ordinary people could do much of the construction, but often experts were needed for framing. Click here to see examples of wooden framing. Wood framework systems are important to consider because they determine the size of the house. The basic building block of Chinese architecture is the bay or "the space between," which is the space defined by roof supports. Chinese houses almost always consist of an odd number of bays; an even number of bays is considered unlucky. Therefore, three- or five- bay houses are common. The three-bay house can be understood to be the basic unit of Chinese homes. Depending on the size and the wealth of the family, these houses were added on to, often in standard ways. One common extension of the three-bay house was the creation of a courtyard dwelling. Traditionally, one family would share a courtyard space. Courtyard houses epitomize traditional Chinese architecture. 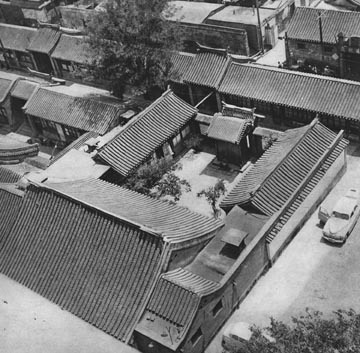 In Beijing, depicted here, such courtyard residences have been typical since the Yuan dynasty. Can you identify a basic three-bay unit in this courtyard home? How many bays do you think are found in this dwelling? A notable feature of the courtyard house is that the complex is fully enclosed by buildings and walls. There are no windows on the outside walls, and usually the only opening to the outside is through the front gate. Why do you think there are no windows on the outside of the compound? What would be the appeal of living in this sort of courtyard compound? It was not easy to see what a house contained by peeking through the front gate. Courtyards were constructed so that when one looked through the first doorway of the house only a brick screen was visible. Access to the rest of the house required first turning a corner. Ideally, the main door did not line up exactly with the inner quarters. What kind of impression would this type of entry give the visitor? 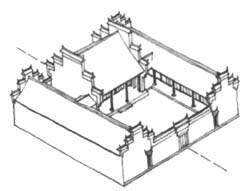 The sizes of courtyard houses vary greatly depending on the wealth, size, and the taste of the family, but generally the compounds had an inner courtyard (or a series of inner courtyards) and were built on a north-south axis. Like the simple three-bay house, the door of the main building faced south. The line drawings below show how the courtyard shape could vary while retaining balance. 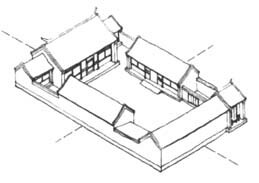 As the two-courtyard house diagram above shows, new courtyards could be added creating a multi-courtyard dwelling. Doorways to the east or west could open into a garden. 2. Rooms facing the rear. The rooms facing the back, those near the entrance to the courtyard were reserved for the servants if the family was well-off. 3. First courtyard. Cooking was carried out here, and the second courtyard was a living space. 4. East and west-side rooms, for the sons and daughters, or the sons' families. 5. Inner Hall. Where the members of the family greeted guests or where family ceremonies were held. 6. Main building. Living space for parents. 7. Small side rooms. These used for children and extended family members. What can the diagram tell us about the organization of Chinese families? 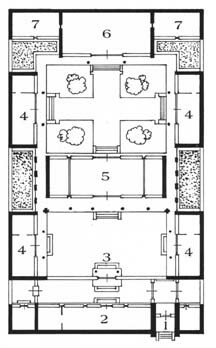 Why do you think the rooms at the very back of the courtyard (number six on the diagram) are reserved for the older family members? 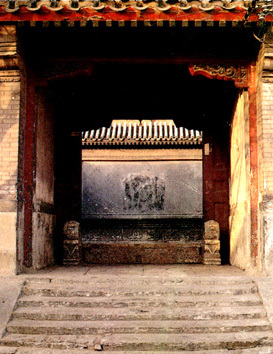 The courtyard was not only the basis of design for Chinese homes, but was also used in the design of more complex structures such as palaces and temples. The courtyard layout can be clearly seen in the overview of the temple at left. 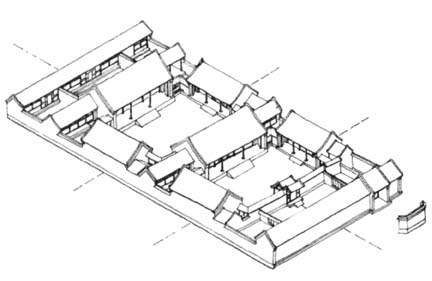 Although the three-bay house and its elaboration in the form of courtyard houses were the basic module of Chinese architecture, there was a great deal of regional variation. Looking at the variation of house design can tell us a lot about climactic differences throughout China, as well as the different aspirations of people from different regions. There has also been a great deal of variation in interior design and the decorative elements used in houses. Move on to decorative elements in Chinese homes.